Under the Constitution of the United States of America, before there can be a trial in a murder case, the evidence must be presented to a grand jury and the grand jury must evaluate that evidence and make the determination as to whether or not there is enough evidence to indict anyone for the crime. Dave Reitzes, in his Skeptic article, calls for a careful and sober analysis of the evidence, and a number of other threads have descended into an argument over the evidence and what it means. 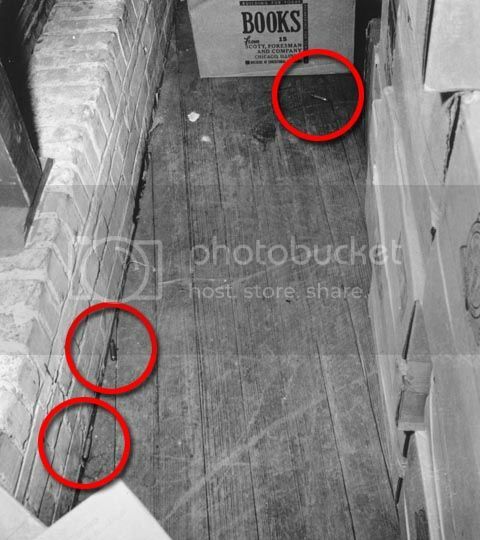 DVP says that the evidence proves Lee Harvey Oswald was the assassin because the bullet shells found at the scene were at one time fired through the rifle, the rifle was purchased through the mail by Lee Harvey Oswald and found on the Sixth Floor of the TSBD, so therefore Oswald must have fired the bullets that killed the President. Oswald told his brother, "Don't believe the so-called evidence," and indeed, there are many questions as to the origin of the bullets, where did they come from? 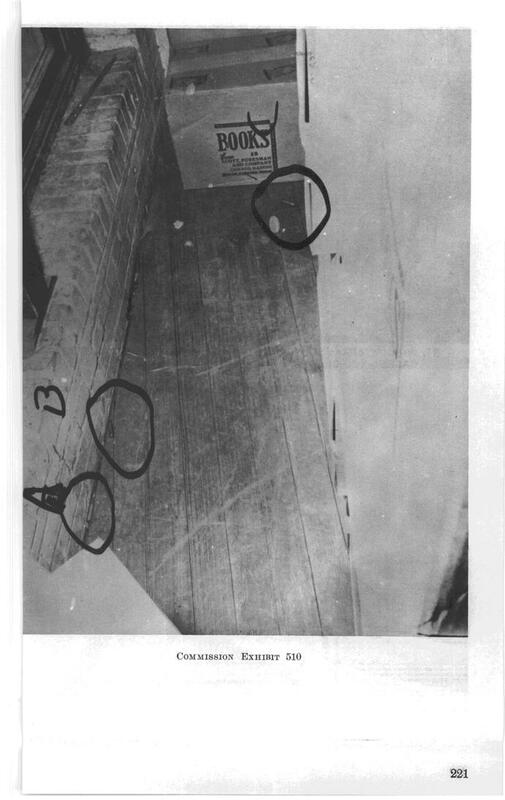 While i will introduce each piece of evidence, one at a time, to a devoted thread, in the order in which the evidence was discovered, beginning with the bullet shells discovered by Dallas Deputy Sheriff Luke Mooney at approximately 1:10 pm on 11/22/63 under a window in the South East corner of the Texas School Book Depository. 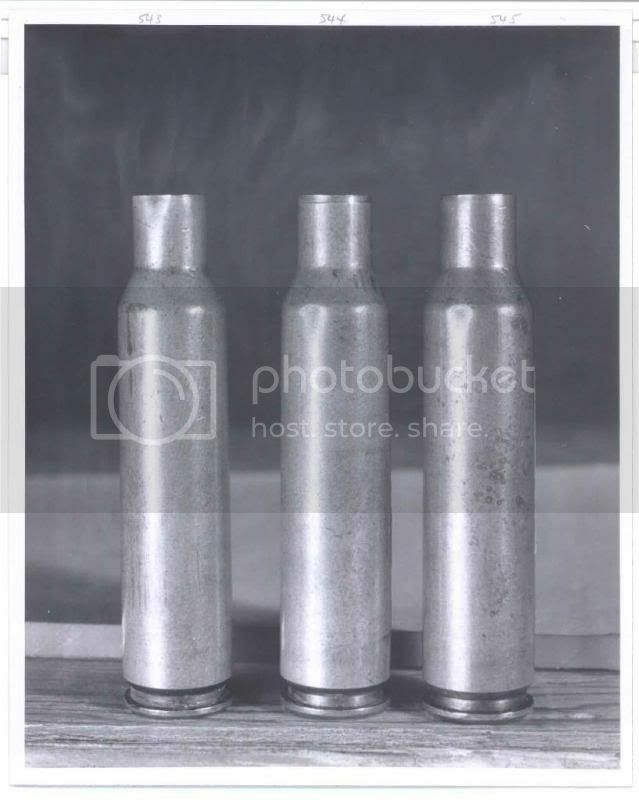 It would be nice if someone could provide a photo of these three shells - and the Warren Report photo of them on the floor with the circles around them. This thread is devoted strictly to the topic of the shells and what they tell us and I ask people to please stay on topic. Additional threads will be started on other exhibits - including the boxes of books, the paper bag, the rifle, etc. but we should stick to the shells first as they were the first pieces of evidence discovered in the crime. were thrown back down again prior to this photo being taken. Alyea's position as a first day, real time witness to that is certainly clear, he has expressed it in many places and I've had him tell it to me in person. And Larry, I was going to provide a link to Tom Alyea's story, but for those who don't know it, Tom was a TV cameraman who got into the TSBD before they sealed it and was permitted to film the Sixth Floor before and during the search and discovery of the rifle. Alyea says that he requested permission from Capt. Fritz to film the interior of the Sniper's nest before it was photographed by the DP. Fritz said sure, and went in between the boxes, and against all the rules of Crime Scene protection, picked up the shells in his hand and showed them to Alyea to film and then threw them back on the floor. So the positions they are in this photo is how they ended up after Fritz threw them there, not how they were originally arranged. 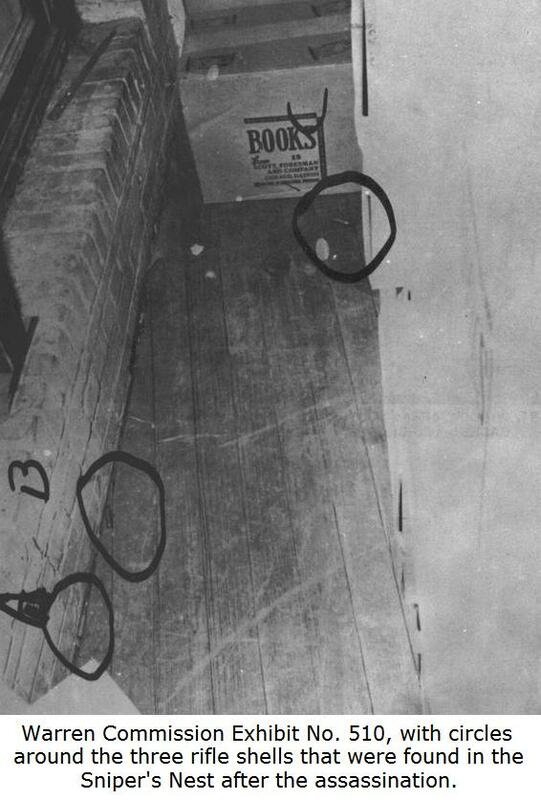 According to Mooney, the Sheriff's deputy who discovered them, they were arranged all together in a line in a small area that you could put a bucket over, as if they were placed there and not in seemingly random positions they would be in if ejected from the rifle. Now if Alyea's story is true, and I believe it to be so, even though the film he said he took is no longer in evidence, that Capt. Fritz would intentionally do something like that is not an accident, but intentional, and if intentional, he's telling us that such evidence doesn't matter, and that's how they - the Dallas PD seem to treat all the evidence. Can someone post an official photo of these three bullet shells? Taken together as evidence, one apparently has a dented lip. Is that true? And if so, what is it that Tink Thompson mentions about this? Another anomaly is the fact that when the FBI demanded all of the evidence in the case be flown to Washington to be examined by the FBI crime lab, only two bullet shells were turned over, and one kept back - by Capt. Fritz? What was that all about? Was the shell with the dent the one kept back? At the FBI lab these bullet shells were found to have been run through and ejected by the rifle that was also found on the Sixth Floor. Au contraire, i seems to me that Fritz may have done this intentionally because he thought that evidence does matter. He picked the shells up and threw them down again because he didn't want them photographed arranged all together in a line by whichever idiot had placed them that way. According to Mooney, the Sheriff's deputy who discovered them, they were arranged all together in a line in a small area. Fritz...picked the shells up and threw them down again because he didn't want them photographed arranged all together in a line by whichever idiot had placed them that way. Maybe it's time to stop believing Roger Craig's craziness. The shells were not lined up all in a neat little row. The idea that they were is just dumb....and would certainly be something no "shell planter" would even begin to want to do, since it would obviously indicate something fishy with the shells. LUKE MOONEY - The minute I squeezed between these two stacks of boxes, I had to turn myself sideways to get in there, that is when I saw the expended shells and the boxes that were stacked up looked to be a rest for the weapon. .... I didn't lay my hands on anything, because I wanted to save every evidence we could for fingerprints. So I leaned out the window, the same window from which the shots were fired, looked down, and I saw Sheriff Bill Decker and Captain Will Fritz standing right on the ground. JOSEPH BALL - Now, I show you 510. Mr. BALL - Is that the empty shells you found? Mr. MOONEY - Yes, sir. Mr. BALL - Are they shown there? Mr. BALL - Now, will you take this and encircle the shells? Mr. MOONEY - All right. Mr. BALL - Put a fairly good sized circle around each shell. That is the way they were when you saw them, is that right? Mr. BALL - Is this the position of the cartridges as shown on 510, as you saw them? Mr. MOONEY - Yes, sir. That is just about the way they were laying, to the best of my knowledge. I do know there was--one was further away, and these other two were relatively close together--on this particular area. But these cartridges--this one and this one looks like they are further apart than they actually was. Mr. BALL - Which ones? Mr. MOONEY - This one and this one. Mr. BALL - Now, two cartridges were close together, is that right? Mr. MOONEY - The one cartridge here, by the wall facing, is right. And this one and this one, they were further away from this one. Mr. BALL - You think that the cartridges are in the same position as when you saw them in this picture 510? Mr. MOONEY - As far as my knowledge, they are; pretty close to right. didn't Fritz tuck away one of the 6.5mm cartridges in a desk draw for weeks? If so, what's the relevance as to all 6.5 cartridge casings re court evidence? You really do have trouble thinking outside of the box, don't you, Dave. Try this one on for size; how do you know the assassin did not pick the empty cartridges up, wipe his fingerprints off them, and put them down in a neat little pile? Translation --- Unlike many conspiracy theorists, DVP has a hard time pretending the bullet shells were in a condition that is not supported by the witness testimony. You really do have trouble following simple testimony, don't you Bob? Let me guess -- Luke Mooney is a xxxx. Right, Bobby? You seem to be implying that he is. Any particular reason? Well, unless Alyea was lying (and why would he make up such a story? ), and if Mooney did not say the shells were found arranged neatly in a line, this to me is perhaps the strangest, most inexplicable thing that happened that day. I can't come up with any hypothetical, non-conspiratorial explanation of why a police captain would handle evidence that way (picking up the shells and throwing them back down again like dice) at the scene of a presidential assassination. Such contempt for the crime scene suggests to me that Fritz was in on it from the git-go and considered everything to be in the bag. The position of the shells didn't mean squat. He apparently even kept one shell as a souvenir of the "big event." It would also explain why he didn't record Oswald's interrogation, why he apparently made no effort whatsoever to see that Oswald was shielded during his transfer, and whatever else Fritz did to look like a complete incompetent. He thought that he and everyone else involved were simply untouchable. And if that's what he thought, by Jove he was right. Yes, the same Mooney who ran into two fellows coming down the stairs and assumed they were plainclothes deputy sheriffs; and never exchanged a single word with them. How many plainclothes deputy sheriffs do you think there were in the county of Dallas in November, 1963, Dave? to keep a hull so they could investigate where Oswald got his ammo - they needed it for comparison. the hulls and boxes and crime scene....he pretty much just never replied.